Ah, this long anticipated family battle has finally arrived. Methodist Meltdown, Fratricide-apalooza, whatever you choose to call it, today’s match-up will be epic. While they share a Collect, today the sibling rivalry will be bitter. A fitting end to the Round of 32 as tomorrow we kick off the Round of the Saintly Sixteen. Yesterday, despite his impressive name, Samuel Isaac Joseph Schereschewsky lost to Harriet Bedell 63% to 37%. While he will be missed, those responsible for updating their church’s poster-sized brackets will rejoice. Harriet will go on to face Thomas Gallaudet in the next round. We recently heard a rumor that there are still some people who have not liked us on Facebook or followed us on Twitter. That seems impossible. In any case, it’s time to vote between a heart “strangely warmed” and a “strange palpitation of the heart.” If you find your own heart beating too fast with this heart-thumping saintly action, please call your cardiologist. The Supreme Executive Committee is of limited help in such matters of the heart. It may not be completely fair to call John Wesley an overachiever, but he provides good reasons for making that case. An excellent student, John attended Christ Church, Oxford, where he and his brother Charles established the Holy Club. They were mockingly called the Methodists because they were so methodical about church attendance, Bible study, prayer, and service to the poor. After they were ordained as Anglican priests, the Wesleys went to the primitive colony of Georgia where they failed to impress anyone, and John managed to get sued for breach of contract by his sort-of former fiancée. John came back to England utterly downcast. While in the New World, John had become friends with Moravian missionaries. It was while attending a Moravian service in Aldersgate that John felt his heart “strangely warmed,” and he gained a new understanding of God’s grace. It is out of this Aldersgate experience that John rebooted his ministry. He used his remarkable organizational skills to establish Methodist societies within the Church of England, though he was barred from preaching in most churches due to his evangelistic methods. He often traveled more than 4,000 miles a year–250,000 miles during his lifetime. He preached over 40,000 sermons, mostly in the open air to working class people. He published 233 books, receiving over £30,000 in royalties, most of which he gave to charity, including funds to establish the Kingswood School in Bristol. Although he remained an Anglican priest throughout his life and did not intend to found a new denomination, his ordination of two lay preachers set the stage for the split of Methodism from the established Church of England. He continued preaching until days before his death at age 88 in 1791. Lord God, who inspired your servant John Wesley with burning zeal for the sanctification of souls, and endowed him with eloquence in speech and song: Kindle in your Church, we entreat you, such fervor, that those whose faith has cooled may be warmed, and those who have not known Christ may turn to him and be saved; who lives and reigns with you and the Holy Spirit, one God, now and for ever. Amen. Charles attended Christ Church, Oxford, where he and John gathered with close friends for regular communion, religious study, and prayer. Because of the group’s fastidious and structured habits, they were snidely called “Methodists” by their peers; the name stuck. Anyway, Charles was ordained in 1735 before going to serve as a missionary in the colony of Georgia, where he would preach and minister while also serving as the secretary to the colony’s governor. Charles found life in Georgia difficult and was often caught in the crossfire of his parishioners’ feuds; he returned to England after three years. Charles experienced an inner conversion on Pentecost Sunday, May 21, 1738, at the home of the English Moravian John Bray. He described it as a “strange palpitation of the heart,” in which he gained the confidence and assurance of Jesus’ great love for him. His brother John’s famous Aldersgate experience would come three days later. The brothers would then go on to preach and proclaim that experience to all in England, especially in fields, factories, and under-churched populations. Lord God, who inspired your servant Charles Wesley with burning zeal for the sanctification of souls, and endowed them with eloquence in speech and song: Kindle in your Church, we entreat you, such fervor, that those whose faith has cooled may be warmed, and those who have not known Christ may turn to him and be saved; who lives and reigns with you and the Holy Spirit, one God, now and for ever. Amen. 221 Comments to "John Wesley vs. Charles Wesley"
Charles was “saved” first. Lo! He comes with clouds descending! I should add that among my forebears in the 19th C. were John Wesley Sage and his son Charles Wesley Sage [Sage is my mother’s maiden name]. One of them, I don’t know which, was a preacher in the old Bretheren Church, now part of the UM Church. It’s true that Charles is easier to look at than John, but, hey, John did more than just write hymns! And John is better remembered! There is no “just” to writing hymns. They’re another way of communicating the Gospel. That picture of John Wesley makes him look like my grandmother! LOL! He also appears to be slightly grumpy in that illustration! I’m going with the hymn writer and the one that stayed an Anglican to the end. They both stayed Anglican to the end. Except for that presbyteral ordination thing, yes. John and Charles were both loyal Anglicans. Unfortunately, John lacked the prudence and caution that his younger brother had. Unfortunately? Maybe fortunately. I think it’s a mixed bag of cookies where the fortune is concerned. But I did notice a typo in Charles’s collect (and I, a Baptist, of course voted for him on hymnodic grounds); “them” should read “him” as it does in John’s. Not quite a typo: they share a commemoration and therefore, a collect; “them” is correct, actually, and “him” is edited to separate them for this one instance. I voted for Charles, too, for the beauty of his hymnody and the gentleness of his demeanor toward the staid old ship, even as he sought to transform it for God’s sake. As I’ve heard somewhere, the Methodists left us Anglican types the grand fireplace, but took the fire. I don’t actually believe that, even as an Episcopal graduate of a Methodist seminary, but it’s been said…. One of my great hopes for the hereafter is that I stand somewhere near sweet Charles, “lost in wonder, love, and praise.” Can’t imagine anything more heavenly! Tough choice today. I went for Charles in the end, for his loyalty to the old ship (of fools), for the seasonal hymns which I look forward to singing every year, and also because God has a habit of picking younger sons. Thank you for this delightful post! Hehe! This made me giggle. Plus as a younger daughter, I totally dig. Being from Savannah, Ga. and growing up at Wesley Monumental Methodist Church,I can relate to this match-up more than any before. I have always favored Charles for his dedication to music and his Mother Church. I was 3 at the unveiling of John Wesley’s statue in one of the squares, sitting up front with my Grandmother. When the cover was removed the tall bronze brooding John looked down at me, causing great surprise and fear. It was a proud moment for Grandma a fearful one for me. As a Methodist seminary student who is in the midst of a history class, I have to do with John. His work brought Christianity to America in profound ways. While there were some Anglican priests in the country, they were not traveling through the wilderness like the circuit riders were doing. Breaking away from the Anglican church was necessary since it was not allowing people to hear the Gospel or receive the sacraments. Grace, I’m not picking a fight, but as a librarian, could you please state your source that the Anglican Church did not let people hear the Gospel or receive the sacraments. I’m interested because I’m wondering how the people found out about the Lord, if that was the case. Thanks for your input. The key text on how the Church of England completely dropped the ball in the Americas is “The Churching of America, 1776-2005: Winners and Losers in Our Religious Economy” by Roger Finke and Rodney Stark. Anglican/Episcopalian church went from by far the largest and most popular religious body in the colonies in 1776 to being the smallest of the major denominations by 1850. The Methodists and Baptists had a frontier mentality, they followed where the people were moving, while our Anglican/Episcopal forebears had a fortress/Temple/parish mentality, “let the people come to us”. Grace, thank you for the additional historical information so important to John’s achievement as an evangelist in North America. According to Wikipedia, John Wickliffe translated the Bible into English in the 14th Century. One of the results of the Church of England’s split from the Roman Catholic Church was having the services in English (The Book of Common Prayer). Both the wine and bread were given at communion. The people heard the gospel in English, could read the Bible in English and receive both sacraments. Anglican priests may not have been as likely to “circuit ride” in the 18th Century.Certainly the Methodists and Baptists were much better at that. Absolutely enjoyed and join the four comments so far. Regarding Joel’s, John does not paricularly resemble my grandmother, but I have two older brothers named Charles and John which does add to the pressure. But our beautiful Trinity Church was built in the English Gothic style by shipbuilders and we sing the hymns to the rafters (in the old ship that warms our hearts with…strange palpitations). Charles it is. I grew up Methodist. I’m voting for Charles. John is scary. As a Wesley as well as a choir member for many years, I have to go with one of my favorite hymn writers, Uncle Chuck!! Ann, I agree. John doesn’t look very warm or fuzzy. Never knew about the conversion stories. The Holy Spirit was moving that Pentecost! Makes one curious about what was going on in the Moravian Church at the time. BTW, Episcopalians are in full communion with the Moravian Church, so Episcopal visitors can fully participate. Thanks, Molly, I didn’t know that about the Moravian Church. The Education for Ministry class I attend has just finished reading about the Reformation, including the Pietists. I was impressed by what Diarmaid MacCulloch called the cheerfulness of the Moravians. Finally! The battle for which I’ve been waiting! I prepared early for this one, taking advantage of a meeting at the end of last month of the United Methodist-Moravian Bilateral Dialogue. I polled the United Methodist dialogue members and staff, Holy Scorecard in hand. Once I got passed the strange looks (brackets? Golden Halo? Huh? ), a lively discussion began. The clear consensus was “Vote Charles.” His hymnody weighed in as one factor, and his personality as a second. One said, “When I first started learning about the Wesley’s, I didn’t like John at all.” So, to honor my dialogue partners, I vote Charles. BTW, they also assumed John would win by a landslide. Prove them wrong! We sang it at our wedding, as we processed out. As always, I choked with joy on the last line…still do. The hymns are some of the greatest ever written. This contest isn’t even close. Not voting today – but really “new world” — a very colonialist term. It was not “new” to the people who had lived there for generations only to the Europeans. Clearly I’m outvoted today, but as a presenter and frequent flier whose ministry focuses on the Bible and the “method” of the Daily Office I’ve got to go with the traveling John. Are you the Rodger of “March Fourth!” fame? If so, belated happy one. 😉 Sorry, but I’m going with Charles. Hymnody wins for me. Pax vobiscum. Yes, John’s impact on the faith and on society far exceed those of Charles. Just the story of his effect on Guiness is enough to blow your mind. While an cradle Episcopalian, my Methodist roots come through my paternal grandfather’s family. I have always admired both John and Charles as they were both endowed with eloquence in speech and song, making this choice even more difficult. John’s ministry was groundbreaking, but I so love the hymns that Charles left us. My vote has to stay with Charles for staying loyal (?) to the Mother Church till his end. Again, they were both loyal to the end. Hymnody before Homily, Charles all the way! As an Episcopalian with Wesleyan sympathies, studying at a Methodist school, my heart and my vote are with John. His writings – along with the ministry of so many friends and mentors in the Methodist and Wesleyan-Holiness traditions – have been a tremendous gift to me. Very well said- my vote went with John as well. The soundtrack of worship and prayer in the church of my childhood — my heart — and my vote – are with Charles! The toughest choice of all, especially having earned an M.Div. degree from Perkins School of Theology, Southern Methodist University, last May. I fell in love with John Wesley’s sermons and learned that he was also a master of satire. His sermon against “Enthusiasm” is right up there with Swift and Pope. That said, Augustine of Hippo said, “He who sings prays twice,” and a reliable source said that, without “Hymns Ancient and Modern” and Charles Wesley, our fellow Episcopalians wouldn’t have much to sing. So, Charles it is. If you haven’t already, Elaine, track down a Methodist hymnal and read Charles’s rules for singing in the front. They’re hilarious. I vote for the little brother. Its not easy being younger! John does not warm my heart, but “Love Divine, All Loves Excelling” sets it afire. As well, I rather like Charles’s desire to prevent division in the Church — while conceding that the Anglican Church wouldn’t exist had there been no division originally. Bottom line: Music has converted more people than preaching has. My opinion. I went with Charles primarily out of older-sibling-overachiever guilt. Go little brother!! It’s well worth pointing out that John never left the CoE and He never tried to leave. He was just responding to a very real need (albeit in a very ham-handed way). John’s theology has been near and dear to my heart these past few years, especially the idea of the open table. I came to faith largely through music, and it is still the deepest way of prayer for me. Charles gets the vote today! Hymn writer all the way. As a former Methodist, I have to go with Charles in thanksgiving for finding the “Mother Ship”! I just had to vote for Charles, because my Great Grandfather was named Charles Wesley Beldin. And I love Charles’ hymns. This one was a no-brainer. It seems to me that Charles’ hymns are far more lasting than John’s decision to split from the Church of England. I also suspect that Methodism today bears little resemblance to that of his own day. Of course, the same can be said of all denominations. Still, Charles’ words continue to stir and I haven’t heard anyone quote a sermon of John’s ever. As an art historian, I must say, don’t hold the choices of John Wesley’s portraitist against him when you make your decision! I would vote for both of the Wesley brothers if I could for bringing the message of God’s love to the people through tireless travel and sacred song. The different gifts these two men represent are all vital to the continued strength of the Church. Let’s make it a close vote to honor them both! Yeah – the portraits are quite different – harsh vs. gentle. The two articles are well written. However, John Wesley did not ordain Thomas Coke. Coke was already a presbyter in the Church of England. He “consecrated” him superintendent for the Methodists in North America. Coke had already served the Methodists in England with that title and with no objections. John Wesley did ordain lay preacher Francis Asbury in an irregular or extraordinary manner and sent him to work with Coke as superintendents in America. After their arrival in America, the Methodist Conference changed the title of Coke and Asbury from superintendent to bishop. Close, but Thomas Coke actually ordained Francis Asbury at the Christmas Conference of 1784, at Lovely Lane Church in Baltimore. There is a famous painting of that event. Asbury was ordained Deacon on day 1, Elder on day 2, and Bishop on day 3. John Wesley was quite upset that they used the title of Bishop, rather than his preference of General Superintendent. John only sent Thomas Coke after much pressure from the people of the new nation, who were now without benefit of clergy. Nearly all CoE clergy had returned to England, so there were no sacraments. John sent The Sunday Service, which was basically Morning Prayer, and admonished the People Called Methodist to partake of the sacraments as often as they could. FYI, in the course of my research, I found the great comic Wesley Bros that may interest you. I’ve also posted an interview with the creator of the Wesley Bros comic on the Confirm not Conform blog. He has strong opinions about how he’s voting this morning! The hymns did it for me. I thought the write ups for the bros rather slanted it toward Charles. Just sayin’. My grandmother looked more like Charles….and I voted for him because he resisted schism – something I wish more people espoused today! This one hits home for me in so many ways! As a former Methodist with Moravian roots who has a masters degree from a Methodist seminary, a lifelong church musician, and a current resident of the “primitive colony of Georgia,” I have looked forward to this standoff. Elaine, I obviously missed what you found in John’s sermons; they put me to sleep! John did much for the spiritual life of the colonial Americans and for that much credit is due. But he was so severe and, it always seemed to me, so much less joyful in his theological outlook than Charles. Charles Wesley has always been dear to my heart. His hymns have touched countless Christians in many denominations who sing his spiritually soaring sonnets every week. Even beyond the church, though, think how many people outside Christian communities of faith have been touched by “Hark the Herald”–even through Charlie Brown Christmas specials! My personal favorite line of Charles Wesley: “Till we cast our crowns before thee/lost in wonder, love, and praise.” Love it, love it, love it! *Strangely, no mention in either bio of Susanna Wesley–mother of them both (plus 23 others), patient partner of husband Samuel (who spent his life writing about Job), the original home-schooler, writer, strongly independent woman (she left her preaching father’s church at 13 and joined the C of E). Has she ever been/will she ever be in the brackets? Excellent idea, MaurineRuby. Twenty-three kids. Really? 23? Not a chance for Susanna if she’s not on some church’s liturgical calendar . . .no matter how many children she had or what they did. I’ve loved the hymns of Charles since as far back as I can remember. His work to prevent people pulling apart from the Church of England makes him my choice today. Went with Charles after much angst. Could not choose at all till someone reminded that God often chose the younger son – so,for no better reason than that, so did I. Excellent! Your pun is music to my ears. As a cradle Methodist who cut her teeth (theologically speaking) on the Wesley’ brothers, this is a difficult choice. I found my way to the Mother Ship about 15 years ago but often identify myself as a Wesylan Episcopalian. I love Charles’ hymns and our hymnal is full of them. But, John’s words and actions still strangely warm my heart. If the present day Episcopal church just had a bit more of John’s organizational skills and focus on social justice and lay leadership, it would be much stronger. It was the Anglican Church that rejected John, not the other way around. As a choral singer, I have always connected with the divine through music. Charles’s hymns are among my favorites. (Lowell Mason, who famously set “O for a Thousand Tongues to Sing,” is buried near my home in NJ.) Also, I applaud Charles’s efforts to bring harmony (no pun intended) to the church. Having spent 24 years in Savannah, there is a different “spin” on the Wesley brothers “activities” in the Georgia colony. More like they were “invited to leave” the colony ahead of tar, feathers, stocks, and other unpleasantries. There are several historic markers around the squares documenting their activities. Charles, no other. I voted on birth order, as I, too, am a second born. Also, John founded somebody else’s religion. Finally, John did not write several hymns that I enjoy singing to this very day. I really thought this was going to be hard. Although I am a choir member and love the C. Wesley hymns (we did an evensong that was all C. Wesley texts, what totally won the day for Charles Wesley was his absolute conviction against schism. Our church went through a very traumatic divide where almost 40% of our congregation left with 3 of our 4 priests and almost all the staff and lay leaders. I think division saddens our Lord. One last point: in the great divide at St. Johns all the music staff stayed. I grew up as a Unitarian turned Methodist in high school, but was confirmed in the Episcopal church over 30 years ago. I appreciate John, but had to vote for Charles. His hymns are awesome and I love that I have dueling earworms for the day, O for a thousand tongues to sing and Love Divine.. Wonderful men both, but the hymn writer won out for me. A neat aside about the Moravians: When they sing, even without accompaniment, they segue immediately into 4-part harmony. Suggested reading: A Ballad of Sixty-six Days: Charles Wesley at Frederica. Based on the diary of Charles Wesley while he was in Georgia. Written by retired Episcopal priest, professor and poet William H. Littleton of St. Simons Island, GA. A beautiful tribute to Charles Wesley’s spiritual nature. Good suggestion. It also might assist the biographer to get the facts right. It was John that stayed in Georgia three years, not Charles. Okay, so I’m a choir singer. And yes, I love all those GREAT and familiar hymns, too. But my family’s Methodism stretches all the way back to the beginning, with John, the traveler. He’s the one who took the word to the fields, to the settlements, to the laborers. Imagine travel back then! Wouldn’t you be a bit hardened and grumpy, too? 250,000 miles! 40,000 sermons! Without John, no Methodism and nothing to sing about. I admire both but am more in tune with Charles. The hymns won me over! Methodist-on-Methodist Madness: now you’ve really done it! Well, I’m the youngest, and I like hymns, so I pick Charles. Looking forward to the Saintly Sixteen. VERY TOUGH choice! As a member of the “radical” denomination who solved their differences with the “Mother Ship” by taking the Mayflower, I had to go with John, who persevered in his beliefs in spite of adversities. Even though he didnot “abandon ship”, he laid the foundations for those who could. I love all of Charles’ music, and the ” American Mozart” title is fitting. Both brothers are worthy of their saintly status. Thanks LM for giving me the opportunity to learn about all the wonderful people throughout the ages who have built the Christian faith. Wasn’t John the one who refused to marry his former fiancee out of spite and as such prevented them from being together. We sang “Love Devine, All Love Excelling at our wedding at Christ Church Frederica, (St Simons Island, GA) where Charles was Rector. My vote is for Charles. As a cradle Methodist turned Episcopalian, I’m going with Charles because of the hymns. I had always heard the quote about living and dying in the Church of England attributed to John. Now if Episcopalians would learn to sing the hymns with the proper tunes and a more up-beat tempo! Charles had me at “O for a thousand tongues”! I grew up Presbyterian. As an adult I became an Episcopalian. I attended Wesley Seminary and loved the class in hymnody. Common to all that is the practice of singing the Gospel. No contest for me today: Charles! Now, if Bach and Charles meet in the Elate 8, I will be genuinely stressed. O for a thousand votes to cast, I’m going with Charles all the way! I still wonder if the strange warming in the heart was merely pepperoni on a late night pizza. I grew up in the Methodist Church and attended Methodist collage and seminary. The church has an excellent higher education system. But I voted for Charles. It’s his hymns that remain and connect me to Christ. And those hymns carried me on into Anglicanism and an Episcopal Priest. Charles was a Catholic through and through. His Eucharistic hymns are unparalleled. Today reminds me of how related we all are as Christians. Luther most certainly knew of Huss (founder of what became the Bohemian Brethren/Moravian movement) and called for similar reforms. In 1722, a small group of Bohemian Brethren (the “Hidden Seed”) came under the protection and care of Nikolaus Ludwig von Zinzendorf, a Lutheran Pietist. There, they experienced a revival and adopted some Lutheran teachings (such as Luther’s catechism). During that time, their great missionary efforts began in earnest. Through this, they eventually came into contact with the Wesleys as mentioned above. Today, the Unity of the Brethren (Moravians) and UMC are in full communion with the ELCA, as is the Episcopal Church. We are truly part of a great cloud of witnesses. Hating to choose between either brother, I’ll vote for the underdog, John, today. I think Charles prolific music will help win the day (and hearts), but I would like to see the vote become closer. Charles! Can’t imagine church without the hymns. “Hark!” is about my most favorite Christmas hymn. I have a sister who won’t come to church on Christmas Eve if we are not singing it. I agree with the comment Hymnody is Homily, and Augustine’s — he who sings prays twice. I chose Charles because I love his hymns and have long sung them so joyfully. Went for Charles, because of the hymns he wrote-some of my favorites and I love to sing. Can Love Divine, All Love Excelling trump I felt my heart strangely warmed? Another divine dilemma…..I cast my vote….O for a thousand tongues to sing! Love both Wesleys – their combined feast day (March 3) is also the anniversary of my ordination to the priesthood. In the end, though, I think John let his zeal get control of him, leading ultimately to an unnecessary (in my opinion) split in the Church that i am pretty sure was not his goal. I’ve always seen Charles as having kept John in check–something that is pretty hard for a younger brother to do–so he gets my vote. I have strong Episcopal and Methodist roots, but for the ‘heart palpitations’ and for the ‘old ship’ I vote Charles, besides, I’m the youngest too! Chuck gets my vote. Being a part of a congregation singing “O For A Thousand Tongues…” has often been a transcendent moment for me. The hymns have it. I’ve sung them all my life and they mean so much, both emotionally and theologically. This is just not fair. How am I, a lifelong Methodist, supposed to choose between the two fathers of my church? The preacher in me votes for John, the singer/choir director for Charles, and I know not what to do! Corrections in John’s story–he first met the Moravians on board ship, not in Georgia. Another candidate for sainthood is their mother. Mike, you’re confusing John’s love interest in Georgia with another love interest in England. The one in Georgia married someone else, and John caused a scandal by refusing to give her Communion. Later, Charles interfered with John’s romance in England. John eventually married someone else, but it was a very unhappy disunion. We used to joke in seminary about how if he had been happily married our church might not exist! But John never left the C of E. He took to preaching outdoors when barred from preaching in the churches; but until the end he insisted that the members of the Methodist societies attend services and receive Communion in C of E. The Methodist movement in America became a separate church with the American Revolution…many of the C of E priests returned to England, and the new church was formed to meet the needs of the American Methodists. Those of you who think only Charles was interested in hymnody haven’t read John’s instructions on singing in church. John was such a powerful preacher that, when a mob threatened to stone him, he preached to them and they were all converted. God sent God’s own Son to be the firstborn of the flock; God doesn’t just favor younger sons. Let’s face it, not only Methodists but all Christians would be infinitely poorer without either one of the Wesley bros. But I have to vote, and will go for the “brand plucked from the burning”–brother John! Thank you for those corrections. Wesley historians will appreciate. Suggest everyone read more about Susanna Wesley. Fascinating woman. While John had a better portrait painter, Charles led his brother to new birth (with the Holy Spirit, of course) and even though it was a tough vote, I went with Charles. A hard choice indeed! Having grown up Methodist they are both my heroes, even though I became an Episcopalian. Hymns always win over preaching for me so my vote goes to Charles. Charles is great, a wonderful testimony, a more balanced personality, the one I would want to be friends with, invite over for dinner (with his wife). But I’m left wondering. Would we even know of Charles to vote for him, if not for John. John was the powerhouse, the hurricane, the horse, the lion, the artist of faith, the curator of theologies, the God-obsessed, the conciliator of controversy, the Arminian Puritan, the Orthodox Anglican, the preacher of the Word, the reasoned in argument, the expression of the love to young, old, rich, poor, insiders, outsiders. thanks for this poetic tribute to God’s work in John’s life. 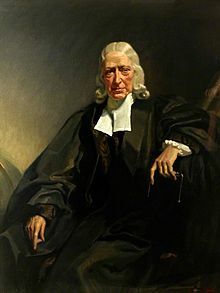 I’m perplexed by the fact that John Wesley”s biographer failed to mention his prolific theological writings which serve as much of the foundation for Methodist polity and practice. John wrestled with “free will” vs. “predestination” and many other topics that his song-writing brother did not. Though I love the hymns, I feel that John had the tougher job. Perhaps that’s why he looks so “grumpy” in his picture. While Charles’s hymns send my heart soaring, I feel sorry for John, who’s being thoroughly trounced right now. Plus, I rang handbells with a delightful and talented Methodist. And I’m the first-born. So John gets my vote. Those hymns! As a lifelong choir singer I have to go with Charles. Do I remember right? Seems like Charles mellowed with age and John became more rigid/legalistic. While both brothers did some hymn writing and in John’s case translating, John was no where near as prolific in hymn writing as his brother Charles. The current Lutheran hymnal that my church uses has 10 hymns by Charles, none by John. Some older Lutheran hymnals have a few by John, but many, many more by Charles. For me the 6,000 hymns was the deciding factor, I voted for Charles! I was drawn to Charles because of his hymns and because of his efforts to stop schism from the Church of England and as a younger brother. When I cast my vote I fully expected to be voting for the underdog. Man was I wrong there! Grew up a Methodist, singing in a Methodist church choir. It wasn’t until I became an Episcopalian as an adult that I had any idea where all those wonderful hymns had come from. Going with Charles. Love Charles’s poetry (he wrote the words, not the music), but John Wesley’s life work is found throughout the world. Because he never saw the Methodist movement as a separate denomination, JW empowered and trained laity in leadership. He formed small groups-classes – that held each other accountable. As the descendant of some of John Wesley’s long-suffering (well, not so very long, since he bugged out pretty fast, but still) parishioners at Christ Church, Savannah, I dispute that the colony of Georgia was so very “primitive,” but I’d say that John could be insufferable. As a musician, of course, I have to go with the hymn-writing loyal Anglican Charles in any case. “Lo, he comes with clouds descending,” and sibling rivalry never dies. May the best brother win – and it looks as though he’s well on his way. Being the second born behind a dynamic elder sibling, I cast my vote for Charles. A note on the Wesleys birth order: Of the 10 surviving children (3 sons, 7 dtrs) of 19, John was 15th, Charles 18th. Samuel was the first son. The theology in Charles’s poems/hymns led me to vote for him. No contest, in my mind. Through his hymnody alone, which has spread throughout almost every Christian denomination, Charles has had the greater impact by far. While John’s preaching clearly affected those who heard him, Charles’ hymns continue to live on — comforting, inspiring, converting and providing a joyous expression of faith to hundreds of thousands within the Anglican Communion and beyond. Thank you, Charles! Wow.. that was easier than I thought. I cry sometimes when I sing Charles’s hymns. I was dreading this match up, but boy, that was the easiest choice I’ve made all season. My heart is always strangely warmed by the music that Charles gave us. Hence, he has my vote. Susanna Wesley was a powerful Christian witness in her own right. What a dilemma…particularly as an alumna of DrewTheological School (Methodist – even though I am a cradle Episcopalian…for generations; go figure)! I was all ready to vote for John and then I read the biographies. Charles’ hymns are certainly some of the best, and ultimately I like the fact that he was able to find a way to keep his experience of renewal within “the old ship” and use it for the Church’s good. I voted for Charles. Well, poor John! Seems all the musicians are voting, but few of the theologians. Charles also wrote some stinkers, folks, and John also wrote hymns and translated many German Pietist hymns. Charles didn’t like lay preachers, either, but they were the backbone of the movement. Plus, Susanna (the mom) thought Charles was wrong about that. Obviously, some of our Anglican friends must be unfamiliar with the “sermons” as theological instruction in the manner of the Anglican Divines of the 17th Century, JW’s model for his “Sermons upon Several Occasions.” And as for those “irregular” ordinations, they came after the Bishop of London refused both JW’s and Fr. Seabury’s requests for sending ordained priests to the new United States. JW acted out of practical necessity, a hallmark of Wesleyan theology; Seabury had to find some Anglican Non-Juror bishops to ordain him. I vote for John. As one of those musicians, I think I mentioned that John wrote/translated some hymns too. And I also recognize that not all of Charles’ hymns as well. My point was that there was a difference in the output in that area. “Jesus, Thy Blood and Righteousness” is an old German hymn translated by John Wesley. As a German Lutheran it is a favorite of mine. But still Charles was more prolific in this area. As a Lutheran, my decision was not based on their theology — though I am sure they were both faithful Christians — but the music is more important to me. However, both of them are on the Lutheran Calendar as “Renewers of the Church”, Mar. 2nd is their feast/ commemoration day on our calendar. So I don’t discount the Wesley brothers’ role in the church either. I recognize the truth of your statement, but this Lutheran musician voted for the more prolific brother as a hymnwriter, Charles, not because I mistakenly thought he alone was involved in writing hymns! I knew better! If the aim of lent madness is to educate us about the saints then it worked for me today. Difficult call but I am going with John–unlike most of the people who are voting for Charles I do not find music or hymns important to my worship experience, and usually attend services where no or minimal music is involved. Also, John went with his heart as to what needed to change in the church, and even though he didn’t set out to start a new denomination, if filled and continued to fill a need for some people. Charles reminds me of people who believe in unity at all costs. They both though, are quite deserving if the his they already wear. Having grown up in a small North Carolina town, I had opportunities to be quite ecumenical. Baptized AMEZ as an infant and confirmed as an Episcopalian at age 13 while playing at Baptist and Presbyterian churches and my own little St. Philip’s Mission (on a pump organ at age 12), Wesley’s hymns are ingrained to my very core! Charles it is + I am Deacon at the Cathedral where the Dean’s father is a noted Charles Wesley aficiando, soloist, scholar, and Methodist clergyman…gotta be loyal! Oh, that’s shattering! Thanks–I’d totally forgotten about this hymn,and I love it so very dearly. It makes me weep, too! Can’t believe I never heard–never even heard OF–this hymn, in 50+ years of singing in the Episcopal Church (plus 3 years at a Methodist seminary–shame on you, Candler)!!! And there are TWO settings in our 1982 hymnal!!! And I love the story of Jacob and the angel and would dearly have loved to have Charles Wesley’s beautiful insight when last I preached on it…it was a pretty good sermon, but this would have made it so much better! Thanks, Corey. You’ve made my day. Hark the Herald Angels Sing and a “man made for friendship.” How do you top that? Easy choice today. Charles. Went in planning to vote for whichever one was the hymn writer (I know, I’m no student of history!) and came out the same way, though I learned a lot in the process. I did not know of their connection to the Moravians–now there’s a church with some great music! Gotta vote for Charles for his musical contributions and for his loyalty to the COE and avoidance of schism. Oh that the Anglican communion today would see him as a model and work out our differences rather than walk away from one another. There is plenty of room for all! I cannot bear the thought of church without music! Gotta go with Charles… By the way, this my first year with LM and I am enjoying it immensely. What do we remember about John Wesley?Duh-the Methodist Church? I have to vote for John – have not read a comment that points out that John took a very brave step in giving the lay members of the church more of a presence. As someone who is working to become a licensed lay preacher in a church that struggles 250+ later to balance the lay and ordained – I have to vote for John. Lots of hymnists out there, but not many John Wesleys. Having been raised a Methodist, I have a particular fondness for both brothers. Having lived through schism in the Episcopal Church, I vote for Charles for his willingness to hold the “ship” together, even though it he didn’t always get the reforms he wanted. Another tough choice, but for me the final piece was the music that Charles composed. So many wonderful memories. It is my understanding that Charles did not compose music. I believe he was a poet, who wrote the words which were set to music composed by others. There are many hymns in the Episcopal Hymnal set to different tunes from those in the United Methodist Hymnal. I am not certain whether any of them are different for songs by Charles. Ah, this one is for little brothers everywhere! I am enjoying on so many levels the absolute trouncing that little Charles is putting on his big brother. And Charles wrote some great hymns too. What’s not to love? I refuse to choose between the two. Both were crucial to the forming the DNA of the Wesleyan tradition. To choose one over the other is to think hierarchically and in polarities; both are too much of our societal way of thinking. Instead of voting for one over the other, I suggest adding several more–many who are unknown but extremely important to what continues to have a strong lay tradition. OK, I live on Charles Wesley Court. How else do you expect me to vote? Beyond that, as I have often remarked, I would almost always rather talk with a musician than a theologian. Furthermore, John never left the Anglican communion though his actions led to the Methodist movement. And I’m a UM by accident of birth. Had I been born into another branch of the church family, I would have no less trouble disregarding the things I find disreputable in it than I do with the UMC. Bottom line: my heart is more strangely warmed by Charles than John. I rather enjoy being triflingly employed some (if not much) of the time. I came to today’s vote with profound dread. How to choose? My heart was with Charles, I love his poetry, and I think it had a greater impact than some have been willing to admit. I looked at the trending, and decided to go with John. He deserves a much closer race than what is currently showing. Forgive me, musicians! Curse you, LM SEC! The hymns….I had to go with the hymns. Have to go with my favorite hymns. Charles’ hymns always speak to me not only through the lyrics, but the melodies are heavenly. It is questionable if John ordained anyone. It may be assumed that he was putting his hands on them to send them on their way to preach the Gospel. I doubt if he thought of it as ordination since he was an Anglican to the grave. I am not a Catholic, but Pope John XXIII said if he had not a Catholic he would have been a Methodist for his admiration of John’s preaching the Gospel. You are correct. Francis Asbury was ordained by Thomas Coke, not by John Wesley. Seems like once they got past their American misadventures, the lads played “tough cleric/nice cleric” very effectively. Passion doesn’t always make you popular, as John shows today. Charles wins my vote with his kinder, gentler Wesleyness. A spoonful of music helps the Methodism go down. I voted for Charles, of course, but I feel a bit sorry for John… I suspect is is going to be demolished by his “little” brother today. Without John’s evangelization, Charles’ hymns might not have gotten the traction to be as loved as they are today. I’m a lifelong Methodist, and while I love to sing, my faith has been formed more by the theology of John, especially his heart for the poor. I vote for John! Another hard choice. I’m become a great admirer of John Wesley as I’ve grown older. He was a great advocate of the poor and downtrodden that carried over to Methodism in the United States, in a greater way than in The Episcopal Church, at least until the last several decades. He was also a great sacramentalist, something I regret that Methodism lost fairly early on. I think my heart wins over my mind on this one. Didn’t mean to quote the last verse twice. But the words are worth doing so! As I’ve gotten older, I realize that the lyrics of great hymns are a treasure trove of theology. In fact reading just the lyrics in a hymn book is a lesson in the faith and beliefs of the writer and the church. When i sang in the Asbury Methodist Episcopal junior choir, the tune seemed to be the important thing. Now I treasure the words. I am a singer and have been my whole life. I love many of Charles’s hymns. It’s just not church to me unless I’m singing, so I had to vote for Charles. My brother is a Methodist pastor and it is throu through him I came to know the brothers. I have to remark on the comments about John looking so severe. That man was the circuit rider of all circuit riders. He covered thousands of miles bringing the gospel to the people on horseback in every kind of weather. I’ll have to go with the big brother even though it was the little brother who was the more gentle in spirit. No way that I can vote against the “man made for friendship.” That’s what faith is all about. To do so would be to invite schism between me and God. Charles it is. I’m a life long Methodist – I even have a John Wesley bobblehead doll. Why didn’t you pick someone to write John Wesley’s bio who at least liked him or empathized with him? Wesley inspired millions to live like Christ. So frustrating to have such a saint and a churchman disregarded at a time in which we are seeking inspiration for living our lives more like Christ. He threw all the power of Methodism behind Wilberforce and anti-slavery. Author leaves out all the amazing social justice work that Wesley led the Methodists to campaign for, sacrifice for, and shame the Anglican church at the time who were neglecting the urban masses that Wesley reached. He did not seek to be a schismatic. He was intensely persecuted for reaching out to the poor on their turf, outdoors. Remember, the rich locked their pews and the poor could not pay pew rents. You are very right! I voted for the hymns without reading the article. The writer treated him very shabbily! He only ordained ministers when the bishop of London ignored his ( and the colonists) pleas for a bishop. His choice let Methodism flow into the midwest and convert the people that needed a church . If I had checked the early results I would have supported John. John Wesley did not ordain anyone. He sent Thomas Coke to America, who then ordained Francis Asbury. Surprised by the landslide! I voted for Charles’ hymns. I had not heard that quote. Good for him! Fooey! This is NOT fair. But I voted for Charles, I’ve sung too many hymns not to. Being a youngest child, who grew up Methodist, returned to the Mother Church who’s youngest (of two) child grew up to be a Methodist Deacon you’d think I’d have to go with Charles, But since that youngest child of mine’s name was John, I guess I make go for the elder of the two greats. My favorite Christmas song is “Hark the Herald…” so I gotta go with Charles here, although his dear brother is just as worthy of a vote. Partial to a songwriter since I love his music. Jack and Chuck, what horrible luck to have one of them gone. It might have been John but who’s to know if they had a go, and they also had a brother named Joe. haunt my organ if I didn’t! We’ve been wearied of late by schisms of late–or at least I’ve been wearied of late thereby–and whatever John thought he was doing, he was the occasion of a serious schism. Maybe I would have cut him more slack if I had recalled the words of the hymn we sing before every parish meeting: after all, to be “by schisms rent asunder, by heresies distressed” are notes of the one, holy, catholic, and apostolic church. Then too I am more and more convinced that theology recapitulates hymnody, and more hearts have been “strangely warmed” by a hymn than by a preacher’s voice or sunlight striking a copper pot. And the clincher: Charles’s experience of God’s grace came on my birthday! Yes John. The fact that Charles was opposed to a schism with the Anglican Church, was a major reason I voted for him. As a long time member of Episcopal Church choirs (65 plus years) my vote goes to Charles for the wonderful hymns he wrote, which I still sing. As a life-long Moravian, I will vote for John but continue to sing Charles’ hymn. O for a thousand votes to win my dear hymn writer’s praise…but I only voted once, honest! Has anyone else noticed that in their respective portraits, John’s hand is pointing down, while Charles’s hand is (sort of) pointing up? Artistic coincidence or sign of temperment? While I love and respect John for his marvelous work, so many of Charles’s hymn simply exude joy and the love of the Lord. It was hymns, at least as much as sermons, that brought me back to Christianity after many decades away. Not an easy choice, but a straightforward one for me. Both John and Charles were faithful servants of God. They put all they had for the spreading of Christ’s mission in the world! I am not really sure on how I should vote, because of the influences of both of them on Christianity through preaching and Hymns to the world and Methodism in particular! But if it were not because of John, there might not be Methodism today! So in this tight race, I vote for the spreading of the Scriptural Holiness in the world through the memorable universal Hymns and inspiring Sermons that turned the world upside down for good! I love the fact that both brothers were so influenced by Moravians and that the revelation of God’s grace and love won them over from their “works” mentality. Gotta go with Charles, “a man made for friendship” and the writer of so many great hymns, including my fave Christmas carol. As a Methodist, I feel pulled to John, but am interested in Charles contributions also. Good to learn more about the saints ! I am completely surprised by the voting! I daresay that if more United Methodists were voting John would win. John was not afraid to back up his ministry with action by choosing the Methodist. Both brothers appear to be of the same mind but this was the one difference I could see. With all due respect to the Wesleys and the Methodists — which I do, and very much so, as mentioned in my previous comment — I’ve always thought that Methodists treated Susannah Wesley (at a slightly lesser and more Protestant way, of course!) like Roman Catholics treat the Virgin Mary. I’ve always wondered whether anyone has every written a paper on that subject. Don’t know if anyone has written a paper, but the topic has arisen in discussions in which I’ve particpated regarding Susanna’s life, influence, and contribution to her sons’ ministries. I should rephrase an earlier comment regarding the birth order of Susanna’s and Samuel’s children. Of 19 children (10 lived to adulthood), John was 15th, Charles 18th. Samuel was the first-born and first son. But unlike Mother Mary, Susanna taught Bible studies in her home, even when her absent husband, Samuel, wrote to ask her to stop! She spent a lot of time developing the faith of her children and educating her large family. match. I voted for Charles because John, as a priest, didn’t have the authority to ordain anyone. Not telling his brother Charles of his intent, also seems duplicitous, – not a good trait for a Saint :-). So even though I was raised in Asbury Methodist Episcopal Church, I couldn’t bring myself to vote for the man who ordained Asbury. GAAAAAHHHHH but with that said, voting Charles for song and for devotion to the unity of the Church. Having earned my M.Div. at Wesley Seminary, and having the statue of the circuit riding John Wesley on my class ring, there was no question for me. Because of the influence of his outspoken, independent mother Susanna, John empowered women in the church, including early Female Exhorters. A passionate Abolitionist, John often offended parishioners because their enslaved servants in the gallery above heard him preach for the end of slavery. When John survived a fire in the Epworth Rectory, Susanna said that he was a “brand plucked from the burning,” and knew that he was destined for a special mission. 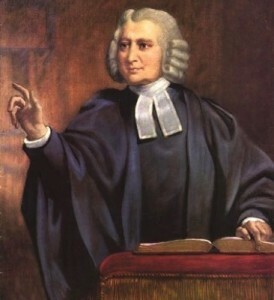 John encouraged the people of the Methodist Societies to partake of the sacraments in the Church of England frequently. His Holy Club practices were much like the spiritual disciplines which the Episcopal Church encourages today, such as Morning and Evening Prayer. I love the poems written by Charles, but I think that John had the more thankless task. The preacher is far more often the target of conflict than is the music director! John was no more in favor of schism than was Charles. The Revolution caused the problem, when the clergy returned to England, leaving the people without baptism or Eucharist for several years. If the Scottish solution had been found sooner, there would probably have never been a split. While in the New World, John had become friends with Moravian missionaries. It was while attending a Moravian service in Aldersgate that John felt his heart “strangely warmed,” and he gained a new understanding of God’s grace. Sooo… We all should be Moravians? Gotcha! I’ve been singing ever since I voted for Charles. Guess which hymn? I started out in life as a Methodist preacher’s daughter (a PK, we say), who grew up with great affection for the Wesley brothers & respect for the ministry of the two in reaching out to those on the margins who were not cared for by the CoE at the time. When I visited in London last year, I spent a delightful morning at Wesley Place, the cluster of buildings where the fledgling Methodist communities lived & worshiped & housed those who would otherwise have been homeless in the last years of John’s life. What a memory trip of the history I had learned as a teen! Because I love hymnody & many of Charles’s hymns (“A Charge to Keep I Have” & “Hark! The Herald Angels Sing”, etc), & because I appreciate apostolic succession (tho I don’t take it literally), I was pulled to Charles, but then I remembered John’s willingness to ordain clergy himself because he was adjusting to the needs of the current church, & my vote had to go with he who would have been more likely to throw in his leadership style with those who could meet the needs of the church community over “the way we’ve always done it.” John was one of the first “emergent” leaders. My vote goes with him. Because my favorite holiday is Easter, not Christmas, my favorite Charles Wesley hymn is “Jesus Christ Is Risen Today”! I think the outcome of this vote is unfortunate and outrageous, particularly the margin of victory for Charles. The truth is most of Charles’ original hymn tunes were failures and forgotten by history. And much of the theology in the hymns belonged to John. Charles’ success was dependent upon John’s success. You could have a Charles because of John but you could never have had a John because of Charles. One correction: Charles did not compose tunes; he wrote poems which were set to the music of others. I voted John. I’m a cradle Catholic who found the Episcopal church four years ago, so I can understand how hard it is to push back against a church that isn’t working the way you feel it should. Besides, we really needed Methodists in the US. I just checked in with other friends who are former United Methodists and are now Episcopalians. Here is what I had forgotten: John did do 2 presbyteral ordinations of Whatcoat and Vesey, in addition to consecrating Thomas Coke as General Superintendent. I also did not remember Charles’ opposition to this. After being gone 5 years, I guess I’m beginning to forget the details of my Wesleyan history! This competition is why people run from the “Christian” life. You are trying to fit into the rest of the world by having an American Idol for followers of Christ. When there is a competition, there is criticism because there has to be a winner or a looser. Who are we to criticize anyone? Much less someone who devoted their life to Christ. Just because you walk around and call your self a Christian does not make you Christ like. It makes you judgmental and holds a bitterness in your hear that closes your eyes and ears to what God has planned for you. This is what makes people run from “Christians” (frankly, I do not blame them) and makes you nothing like Christ. Which is precisely why we encourage those not enamored with the absurd notion of saints “competing” against one another, and the opportunity to learn about some amazing folks who have come before us in the faith, to either step away from the computer or return to watching cat videos on YouTube.